So much in cinema is better left unsaid. And yet, filmmakers increasingly feel the need to spoon feed us every thought, emotion and plot point. This aversion to taking audiences seriously manifests itself in different ways, from the endless expositional dialogue spouted from the mouths of your favourite superheroes in the latest grim adaptation of a DC comic book story; to the constant need to tie up Hollywood love stories in a pristine bow of an ending. Even so-called respected directors are guilty of this creative misstep. With every over-zealously philosophical prequel to his classic Alien, Ridley Scott chips away at the atmosphere of unknowing and fear that the original created. 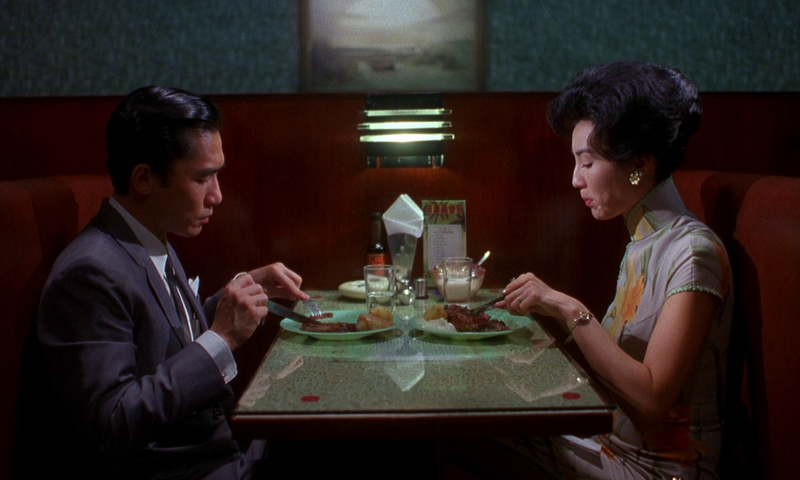 A film which represents the antithesis of this trend is Hong Kong director Wong Kar-wai’s In the Mood for Love. The fact that I came to this near perfect masterpiece 17 years after its release only strengthened its power. For here is a movie where everything that is meaningful is left unspoken, even to the point that the two central characters, played by Tony Leung and Maggie Cheung, move through their increasingly divergent lives with feelings of regret for having not said something. We witness as their relationship blossoms after each rents a room in the same apartment. They have long, meaningless conversations with faceless, absentee spouses, but when they come together entire scenes play out without words, backed only by the bombastic score, and their silence says a lot. Wong does not feel the need to show us these characters make sweeping declarations of love, or have them explain the societal pressures of having platonic relationships with the opposite gender in 60s Hong Kong. Instead, we can see this clearly, in a look, in a smile, in the way a character eats food, in the way they walk. Wong would rather show us curiosity, worry, secrecy, love, passion, regret and acceptance through the posture with which a character sits on a chair reading the newspaper than have that character say what is happening. Of course, this does not mean that it is pulled off with anything less than panache and gusto. In the Mood for Love is styled within an inch of its life. Neon lights wash over Leung and Cheung as their perfectly attired bodies literally drip with water after being caught in a back-alley rainstorm, as well as drip with subtext and meaning. And Wong never wants us to be under any illusions about the relationship he has put on screen for us. The film may be stylised and aesthetically extravagant, but this is a love story grounded in realism. People meet, people fall in love and people drift apart. Not because they want to, but because life gets in the way. Nothing is perfect Wong offers us all of this, and it is as exciting and affecting as any blockbuster. What is different is that In the Mood for Love treats its audience with intelligence.